Aid worker ? Building (Civil) Engineer ? Earthquake relief NGO or volunteer? Then this app is for you. It calculates Peak Ground Acceleration (PGA), Modified Mercalli Intensity (MMI) and it’s effects in seconds. Share short report across text, chat or social app.Generate detailed report. 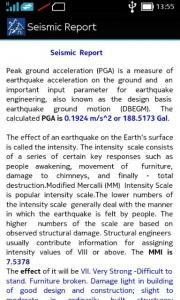 Peak ground acceleration (PGA) is a measure of earthquake acceleration on the ground and an important input parameter for earthquake engineering, also known as the design basis earthquake ground motion (DBEGM). 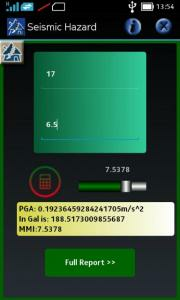 This app calculates PGA in m/s^2 and Gal. 1g =980 gals. The effect of an earthquake on the Earth’s surface is called the intensity. 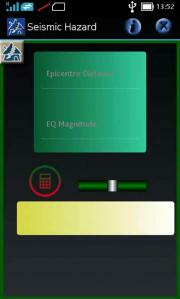 The intensity scale consists of a series of certain key responses such as people awakening, movement of furniture, damage to chimneys, and finally – total destruction.Modified Mercalli (MM) Intensity Scale is popular intensity scale.The lower numbers of the intensity scale generally deal with the manner in which the earthquake is felt by people. The higher numbers of the scale are based on observed structural damage. Structural engineers usually contribute information for assigning intensity values of VIII or above.This app calculates MMI and it’s effect and generates detailed report . LIABILITY WHATSOEVER, WHETHER ARISING IN CONTRACT, TORT (INCLUDING NEGLIGENCE) OR OTHERWISE IN RELATION TO THE APP; AND (B) ALL IMPLIED WARRANTIES, TERMS AND CONDITIONS RELATING TO THE APP (WHETHER IMPLIED BY STATUE, COMMON LAW OR OTHERWISE), INCLUDING (WITHOUT LIMITATION) ANY WARRANTY, TERM OR CONDITION AS TO ACCURACY, COMPLETENESS, SATISFACTORY QUALITY, PERFORMANCE, FITNESS FOR PURPOSE OR ANY SPECIAL PURPOSE, AVAILABILITY, NON INFRINGEMENT, INFORMATION ACCURACY, INTEROPERABILITY, QUIET ENJOYMENT AND TITLE ARE, AS BETWEEN FUTURE AND YOU, HEREBY EXCLUDED. IN PARTICULAR, BUT WITHOUT PREJUDICE TO THE FOREGOING, WE ACCEPT NO RESPONSIBILITY FOR ANY TECHNICAL FAILURE OF THE INTERNET AND/OR THE APP; OR ANY DAMAGE OR INJURY TO USERS OR THEIR EQUIPMENT AS A RESULT OF OR RELATING TO THEIR USE OF THE APP. YOUR STATUTORY RIGHTS ARE NOT AFFECTED.